I have noticed, however, that my love of crime novels and travel has started to merge in a weird way… These are the crime novels that made me want to travel. When I say my love of crime and travel has merged, I don’t mean in a scary way. I didn’t join a Mexican drug cartel when I visited Chichen Itza, or feel the need to shoot any world leaders while I was in Dallas, but you get a general impression. I don’t want to join in with the whole ‘crime’ thing, just see where it happens. Nothing odd about that, is there? Ok, so maybe just a touch. I love true crime books as much as fictional ones. Although visiting real crime scenes is a bit macabre, it doesn’t stop me. Visiting fictional crime settings is a much more acceptable topic for, say, a dinner party conversation with new friends. Telling new people that you love going to real crime scenes will almost definitely put them off. Take it from me. Seriously. Just tell your close family, as I do. You’re almost guaranteed to find someone in there that wants to go do a little dark exploring with you. Thanks, little sister! Often called the Godfather of Scandinavian Crime novels, Per Wahloo and his wife, Maj Sjowall, wrote a fabulous series of books about the fictional detective, Martin Beck, during the ’60s. Martin lives and works in Stockholm and all but one of the novels is set there. The writing is so descriptive and evocative that it really gives you a great picture of that era in Sweden and makes you want to set your time machine and go there. 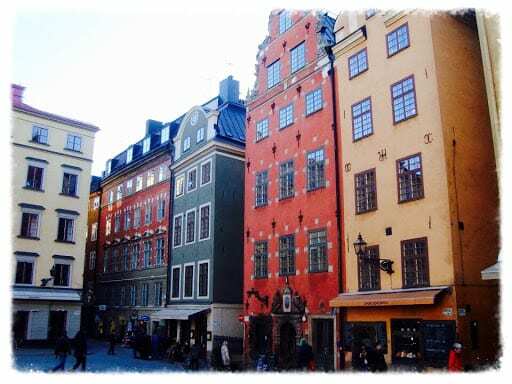 Ok, so Stockholm again, but it’s not my fault they produce such amazing storytellers, is it? No self-respecting crime fiction fan could possibly have missed these books. Mikael Blomkvist and the wonderful Lisbeth Salander live and work in Stockholm, as the author did himself. There are so many references in the book that made me want to visit Stockholm, and while I was there, I also hunted down the Café where the author spent some time during his life. The books are just fantastic and Stockholm is the perfect setting. I was completely taken in by the stories and life of Harry Hole, but the backdrop of Oslo is so well written that I was really keen to go. It almost acts as another character. Despite the violent and crime-filled stories, they don’t portray Oslo as a scary place that you should never visit. It’s just the opposite. Jo Nesbo even makes finding a body hanging in Frogner Park sound so peaceful that I HAD to go there. And it was beautiful. I also loved walking around the city streets that I had been reading about, in particular, Karl Johan’s Gate, in the centre of town. You always build your own picture of what these places look like and it was brilliant to read the next novel after I’d been and truly be able to put myself there. Inspector Lucas Davenport lives and works in Minneapolis and, in this instance, I had actually been to the city before I read many of the books. I have been back since and, like the others, being able to see the streets and buildings I’d read about made the whole experience even better. I love it when books aren’t set in the ‘usual suspect’ cities. Minneapolis is a fabulous city and, just because Sandford exposes it’s fictional darker side, doesn’t make it any less appealing to me.